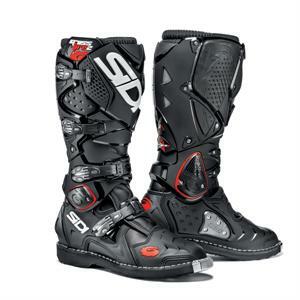 The renowned Sidi Crossfire returns as the Crossfire 2 TA; a lightened and slimmer rethink of the original design. Still a MX boot without an inner bootie, the Crossfire 2 also retains Sidi’s extremely handy sole replacement system. Protection is still the best in the business with a nylon insole, removable arch supports and the Dual Flex System that prevents twisting and hyperextension. Micro adjustable cam lock buckles secure the boot and use memory retention straps so you don’t need to readjust each time you put on the boots. Motocross, enduro and desert, the Crossfire 2 TA has already racked up wins with Tony Cairoli, Kailub Russell and Josh Grant. xclusive Dual Flex System upper offers the industries best fit, especially with knee braces!